New York City- A week-long voting process yielded a 95% percent yes vote in support of a one-day strike which will take place July 31st at over 100 hospitals and nursing homes if an agreement is not reached by then. Healthcare workers say they do not want to strike, and will continue negotiating in good faith to reach an agreement tonight and over the weekend. The legally required 10-day strike notices have been delivered to employers. Members of local 1199SEIU United Healthcare Workers East are voting this week on whether to hold a one-day strike at the North Shore-LIJ Health System and four other New York metropolitan area hospitals if no contract agreement is in place by July 30. George Gresham, president of 1199SEIU United Healthcare Workers East, said Tuesday that 70,000 union members who would be covered under the contract were voting on whether to stage a one-day strike which would take place on July 31 if a contract agreement is not reached by July 30. 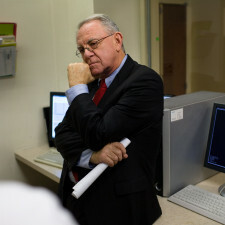 When Dr. Herbert Pardes retired as president and chief executive of NewYork-Presbyterian Hospital in 2011, the institution honored him at its annual “Cabaret” fund-raiser. More than 1,000 guests dined on wild mushroom soup catered by the restaurateur Danny Meyer and listened to Kelli O’Hara, a star of “South Pacific,” serenade them with Rodgers and Hammerstein, Sondheim and Berlin. But there were more thanks to come. 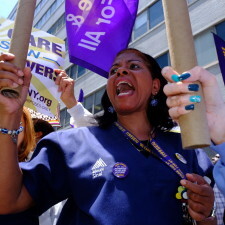 STATEN ISLAND, N.Y. — Ninety percent of the representatives for city healthcare workers at 100 hospitals — including Richmond University Medical Center and Staten Island University Hospital — are voting in favor of a one day strike, which would take place on July 31. “We won’t know until Thursday if there will be a strike, but as of now, about 90 percent of the healthcare workers’ representatives are in favor of the strike,” said an 1199 SEIU United Healthcare Workers East spokeswoman. “Inequality is out of control in our county, especially in New York, and it is becoming harder and harder for working people to stay here, find good jobs, and make ends meet. At the same time, the healthcare industry is transforming, and one third of all healthcare delivery is shifting from hospitals to outpatient facilities over the next few years.